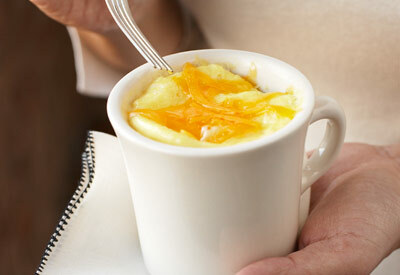 For a quick and easy breakfast in less than 3 minutes, try this microwave egg scramble. Just add your favorite toppings & take it to go! COAT 12-oz. microwave-safe coffee mug with cooking spray. ADD eggs and milk; beat until blended. MICROWAVE on HIGH 45 seconds; stir. MICROWAVE until eggs are almost set, 30 to 45 seconds longer. TOP with cheese; season with salt and pepper.